I'm excited to be writing about the new album from Big Grams. With only 7 tracks to cycle through on the album, it's by far one of the best albums I've heard in a while. 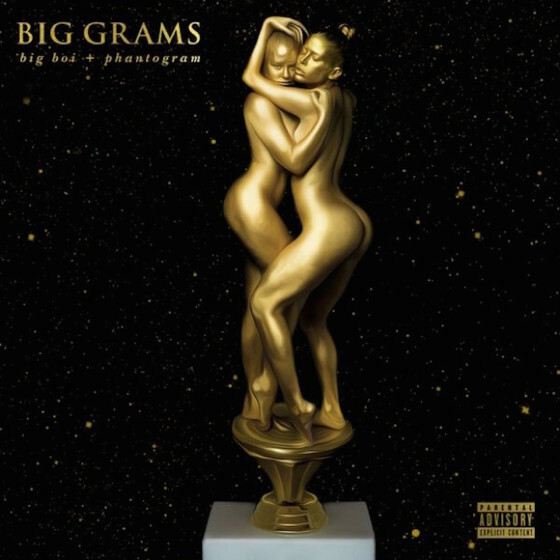 For those who don't know, Big Grams combines Big Boi of Outkast with electronic rock duo Phantogram. Big Boi, most known for his time as one half of Outkast, has built a name for himself that at this point has solidified him as a legend in this business. Given the quality in all he's released throughout he past 20+ years, everything he does catapults to unimaginable success. Phantogram are no strangers to the industry either. The group, consisting of members Sarah Barthel & Josh Carter, released their debut album in 2009. They were featured on three tracks from Big Boi's 2012 release, Vicious Lies and Dangerous Rumors. The connection has been there, and given their musical chemistry, it was only inevitable that they'd eventually collaborate more. While they clearly aren't the first artists to collaborate ona full album, they're still taking things to the next level with Big Grams. The merging of sound in their differential styles is definitely needed in hip-hop. Admittedly, more artists are taking risks these days, but I think many will agree no one has done it to the degree of groups like Outkast. After all, he ushered in Janelle Monae, who has done so many positive things with her music for the urban genre. With Big Grams, Big Boi, Barthel and Carter are definitely stretching the lines of music and broadening the horizons. Much of the album's production is heralded by Phantogram, while Put It On Her is produced by 9th Wonder, and Drum Machine is produced by Skrillex. Born to Shine features an appearance from Run the Jewels, another hip-hop merger consisting this time of Killer Mike and El-P of The Weathermen and Company Flow. I believe most fans, either of Big Boi or Phantogram, should be pleased with the album. Big's rhymes don't necessarily go as deep as most are used to, but I don't imagine that was the point with this EP. The point in my mind at this point is to introduce fans to the idea of them being a unit, and seeing where things can go. Even with this in mind, there definitely are standouts. Big goes for the gusto with Drum Machine, which also features Skrillex. For those who aren't familiar with Skrillex, this is only a piece of what he's capable of. Other potential favorites include the 9th Wonder provided Put It On Her, Lights On, and Born to Shine. Overall, this is a release that should satisfy fans on either end of their spectrum. I, for one, am eagerly awaiting more from this collective.